Blackjack Learn the Strategies and Play to Win! Blackjack – Play Your Cards Right To Win! For the Love of Blackjack! Why is blackjack my favorite casino game? That’s a very long story – but it a nutshell, it’s fast paced, it offers great odds to win, (when played properly), and it is an easy game to learn. I also love that it’s a very social game, as I am a very social girl. The perfect scenario is a table full of people who understand how to play the game, and strategically play together to win. I find that playing and winning as a team, is one of the joys of the game! However, gambling is about money. It’s how to keep score, and there are very important strategies to know that favor the player, not the casino. *Blackjack is also called a ‘natural’ and is specifically, the first two cards any player (or dealer) is dealt out of the shoe that contains both an ‘Ace’ and any card value of 10, including 10, jack, queen or king. Blackjack has many different strategies, I’ve seen them all – the good, the bad and the ugly. Not everyone agrees on every strategy. However, most agree on basic strategy, which is based entirely on mathematical probabilities. Basic strategy gives the player a slight advantage of .0367% over the casino when they follow basic strategy, perfectly. Perfectly – means there is ‘no playing a hunch’ or ‘not drawing a card because your gut tells you too.’ It means being disciplined and following the basic strategy chart for blackjack; which most advance players will memorize. Basic strategy only works if you play it flawlessly; when you vary from it, (by going with the hunch), the mathematical probabilities change. *Basic Strategy gives you a play strategy to follow. It’s formatted by mathematical outcomes based on your two card hand vs. the dealer’s up card. It will suggest the proper gaming action, (whether to hit, stand, split or double down),all based on the mathematical probabilities. Yes, there are many types of blackjack. Including single deck, double deck, pitch, 2,4,6 and 8 deck shoes and even more. The game’s casino rules can vary too, and the combinations of the game can be seemingly endless. I prefer a blackjack table where the dealer ‘must draw to 16, and stand on all 17’s.’ Every casino and blackjack table in the world is different. So be aware before you buy in for chips – be sure to ask ‘the type of game are you are joining.’ Some blackjack tables will pay odds of 5 to 6 on a blackjack, and some tables will pay odds of 3 to 2 – you want 3 to 2 odds, definitely. So be sure to ask ‘what do the odds pay at this table?’ Also ask – what are the table rules, and then follow up by asking how many decks are in use at this game. Those answers are extremely relevant to using the correct blackjack basic strategy chart. I say – beware of the blackjack game that the ‘dealer draws on a soft 17’, because that means they do not stay on all 17’s, (such as a soft 17 / Ex: Ace & 6), and therefore they’re forced to draw a card. In this scenario the dealer can easily draw a small card improving their hand from a soft 17. My point is this – look, ask and be informed before you sit down and buy in. My personal preference is a 6-deck shoe, dealer draws to 16 and stands on all 17’s. That’s the perfect table for me. *Avoid tables that offer an ‘continuous shuffler’ because basic strategy .0367% advantage is not in play with these machines in use. Once you learn the game, and then combine basic strategy with progressive betting strategies, you’ve got a winning opportunity at any table. Both are essential to a successful session of the game. Here is my favorite analogy on betting strategies for blackjack. How does the quote go ‘the definition of insanity…is doing the same thing over and over again and expecting a different result?’ This theory applies to blackjack as well; you cannot play blackjack and bet the same amount, (whether it’s $10 or $100), every hand and expect to win. Because the nature of the game is designed for you to lose, therefor betting ‘the same amount over and over again – is insane.’ You must play strong, have faith in the strategies and learn to press your bets, pressing when winning, and returning to a minimum bet when losing. Variety in betting, and following basic strategy are the two key elements to walking away a winner. 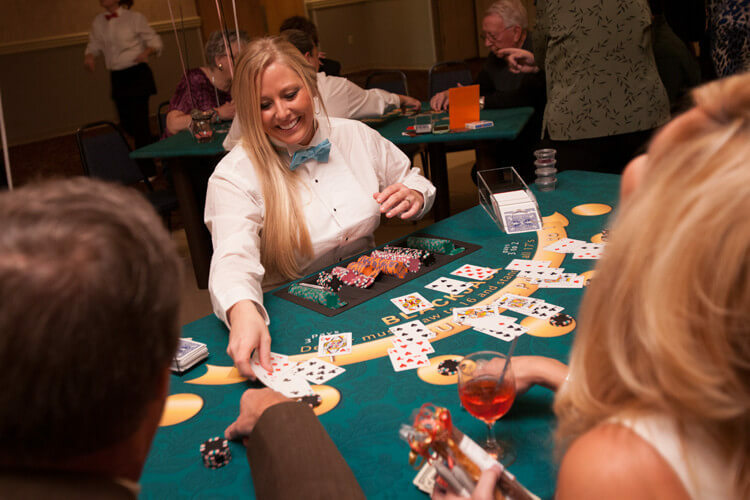 Our team loves to help new players learn all the dynamics of blackjack, (including basic and betting strategies), we believe that a casino night party should be a fun and educational experience so that…everybody wins. In my opinion, At most experienced blackjack players will confirm, your variance decreases and your chance to win big increases. Significantly, if you play strictly by a mathematical strategy. The more hands you play inside, the better your chances. Thank you very much for your comment! 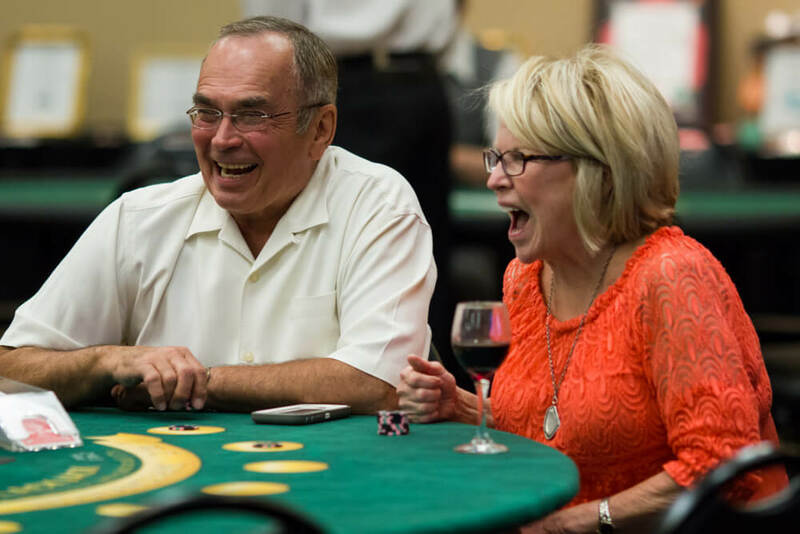 Yes, I have been playing and dealing for 30+ years – so I should know a little something by now!